Hamas leader Yahya Sinwar threatens Israel: If we are attacked, we will let the barrage on Tel Aviv do the talking. 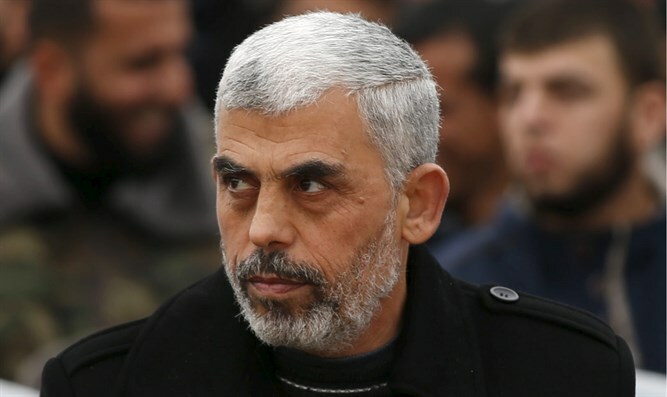 Just days after agreeing to a ceasefire with Israel, Hamas leader Yahya Sinwar on Friday issued threats against the Jewish state. Speaking at a memorial service for Hamas terrorists who were killed during the clash with Israeli soldiers this week which started the latest escalation, Sinwar threatened to kidnap Israeli soldiers and claimed that his organization was holding weapons that were seized during the clash in Gaza on Sunday. Sinwar further claimed that Hamas has photographs documenting the IDF operation, including the evacuation of Lt. Col. M., who was killed during the incident. "I advise Israel not to try and test us again. This time you did not have a lot of casualties and you managed to rescue your special forces," Sinwar said, according to Channel 10 News. “You should not try again, because next time you will have to release thousands of prisoners,” he warned. "Our hands are on the trigger and our eyes are open," Sinwar continued. "Listen Netanyahu, and listen whoever will receive the defense portfolio. Anyone who tests Gaza will find death and poison. If we are attacked, we will let the barrage on Tel Aviv do the talking. Our missiles are more accurate, have a longer range and carry more explosives than before."